Corn Pakoda are a perfect tea time snack which are crispy crunchy from outside and soft from inside. These makes for a perfect accompaniment with tea or coffee and are very easy to make. Here is how to make Sweet Corn Pakoda Recipe or Corn Bhajia Recipe. Evening tea is one of the favorite times for most Indian families. Don’t you agree with me? Waking up after a siesta or getting home from work, gathering around the courtyard, gossiping and sharing stories, and munching into teatime snacks with some hot cup of chai; these were what our childhood was made up of. With less time spent on catching up nowadays, what has remained however is still the food and tea. When it comes to teatime Indian snacks, nothing beats Pakode or fried dumplings. 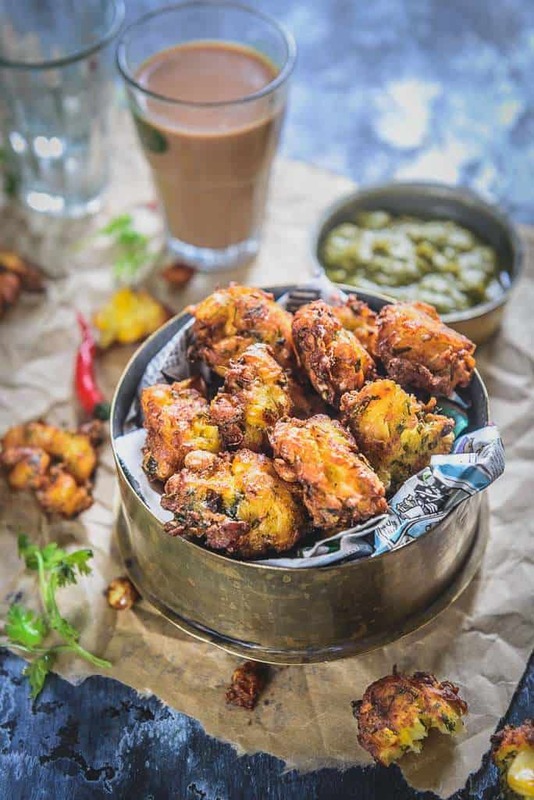 Made up of different ingredients, pakode are addictive and tasty and are a perfect foil to hot tea. Corn Pakoda are made with boiled corn and a blend of spices. They are crisp and crunchy on the outside and soft, warm, melt-in-the-mouth on the inside. Besides corn kernels, you can even add onions and other veggies if you choose. What is important is the gram flour that binds everything together. You can even try making Chawal Ke Pakode and Onion Pakode which are just as delicious. Here is how to make corn pakoda. 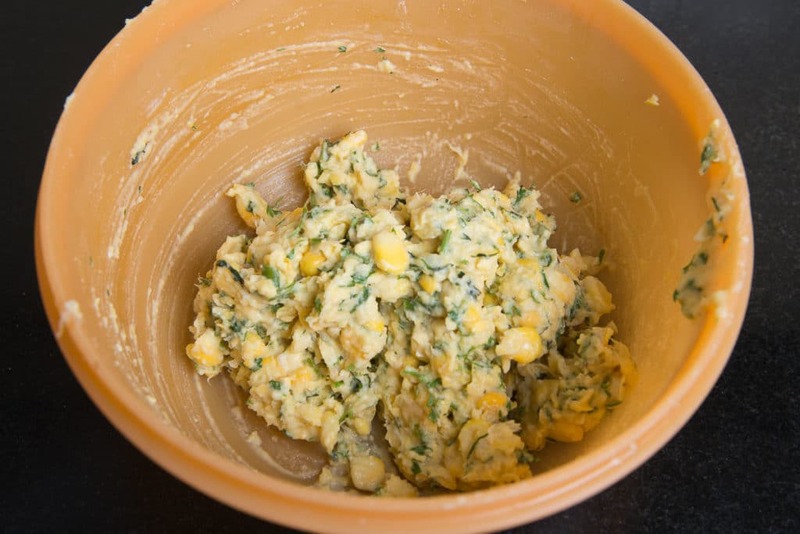 Do not make a paste of corn while grinding it. It should be coarsely ground. The batter should be easily droppable. If by chance you have added more water in the batter, add some more besan to thicken it. If rice flour is not available, you can add some cornflour to the batter. Fry the pakoda on medium heat. If the heat is too high, they will not get cooked from the centre. You can add some coarsely mashed boiled potatoes on the batter and make aloo corn pakoda. You can also add finely chopped onion, green chillies, chopped curry leaves and red chilli powder to the batter. Add grated cheese in the batter and make cheese corn pakoda. To make a jain version, skip the ginger in the recipe. What to serve Corn Pakode with? 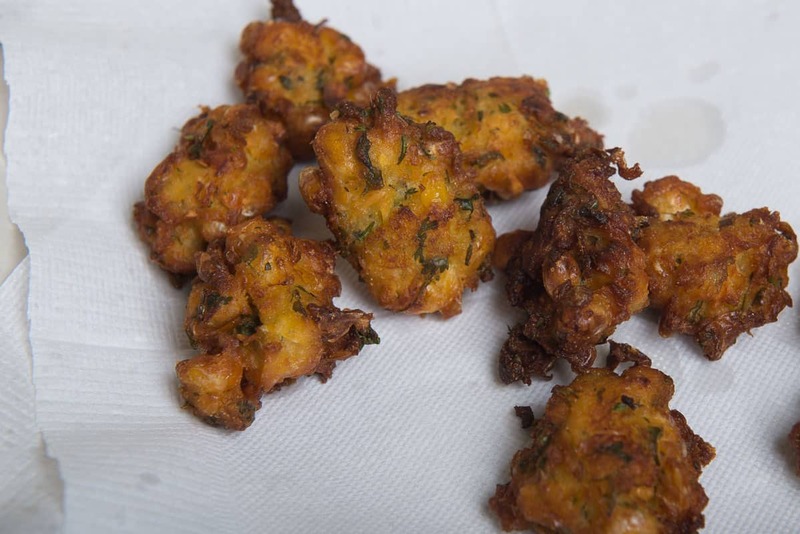 You can serve these pakode with a tangy Coriander Mint Chutney or Ketchup. A glass of tea or coffee to sip along with take these to next level. 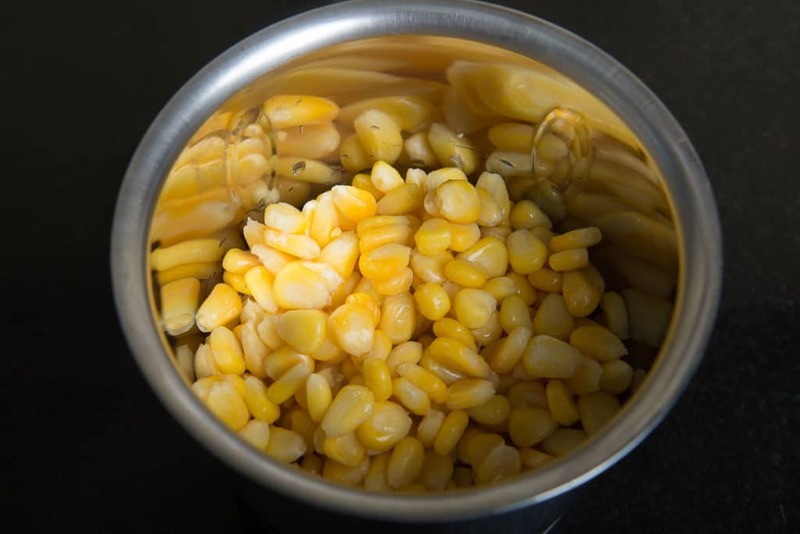 Pulse the corn kernels in a grinder just once to break them into small pieces. Do not over grind. 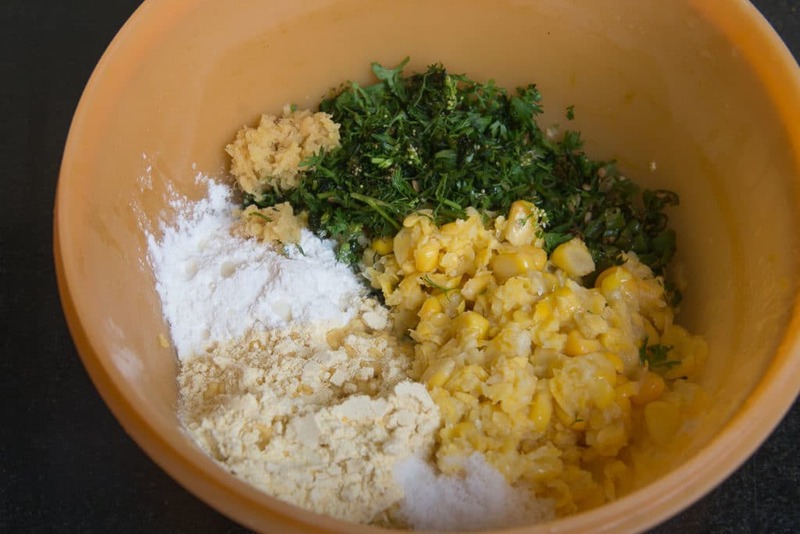 Mix corn kernels, coriander, chilli, besan, rice flour, salt, lemon juice and ginger in a bowl. Heat oil in a pan. Once the oil is hot, drop small portions of the batter in the hot oil and fry on medium low heat until the pakoras are crispy and browned. Remove the pakoras on a tissue lined plate. Serve hot with coriander chutney. 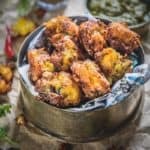 Corn Pakoda Recipe, Corn Fritters Recipe or Corn Pakoda are a perfect tea time snack which are crispy crunchy from outside and soft from inside. 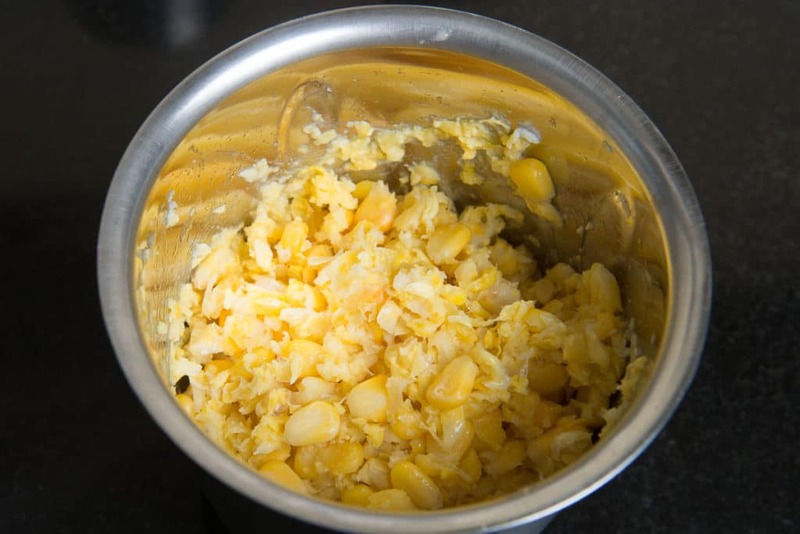 Pulse the corn kernels in a grinder just once to break them into small pieces. 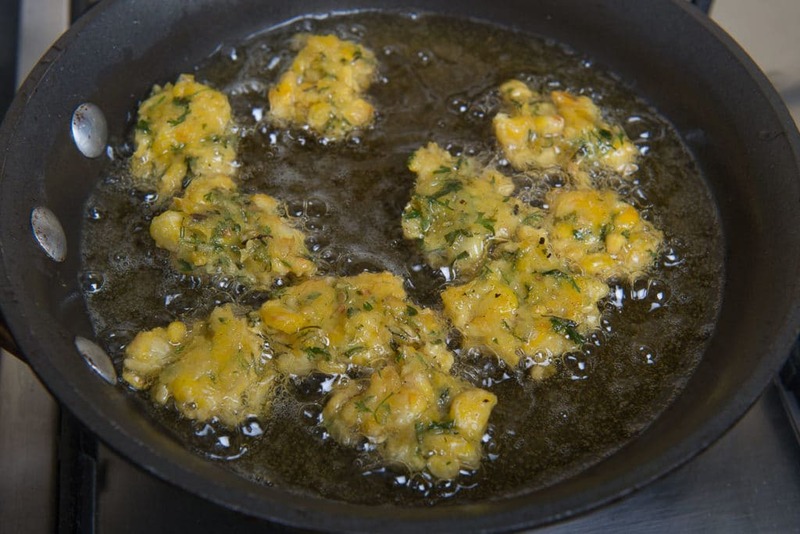 Once the oil is hot, drop small portions of the batter in the hot oil and fry on medium low heat until the pakoras are crispy and browned. Remove the pakoras on a tissue lined plate. Will def try makai pakoda receipe, looks good.